Frieda Hughes publishes an article in Sunday's Times: Richard Woods contributes, as well, "Daughter of Hughes and Plath accuses grandmother of killing their marriage." Read "The Poison that Drove Sylvia Plath and Ted Hughes Apart" by Frieda Hughes, the daughter of Sylvia Plath and Ted Hughes. With thanks to ~VC for the link to Frieda's article. Faber have released the cover for their 6 May 2010 publication of Sylvia Plath's Ariel. This is a very similar design or concept to their 2009 publication of Sylvia Plath: Poems Selected by Ted Hughes. Ariel is scheduled to be published on 6 May. Louise Jury at The Evening Standard is reporting that Ted Hughes will receive a memorial in Westminster Abbey's coveted Poets' Corner. Ben Hoyle at The Times says so, too, in "Ted Hughes to join the great and the scandalous in Poets' Corner." "Bard of Nature" in The Times. "In Praise of...Ted Hughes" in The Guardian. Afria Akbar in The Independent" contributes "Hughes to Join Literary Elite with Poets' Corner Memorial." Tom Payne writes "Ted Hughes' Poetry Explored England's Myths" for The Telegraph. Also for The Telegraph, there is Heidi Blake's "Ted Hughes to be Honoured at Poets' Corner following Campaign by Seamus Heaney." But wait, there's more. John Burnside at The Guardian Blog says "Ted Hughes's Poetry Enriches Us Spiritually and Mentally." Daniel Huws' Memories of Ted Hughes is now for sale in England. Published 1 April 2010 by Richard Hollis, Amazon.co.uk (& Amazon.ca) actually list the title as being in stock. Thanks to Cath in Bath for letting us know! Anne Stevenson is interviewed by Rosita Boland in "Going Against the Grain" in Saturday's issue of the Irish Times. Birthday Letters is mentioned in "When Grief Turns to Art" by Mark Feeney in Friday's Boston Globe. I recently stumbled upon "Reading Plath" in a journal called Kingfisher. This was published on pages 1-2, in 2002's Volume One, Number Three, Seventh Edition. Plath Profiles is accepting submissions still for volume 3, due out in the summer. There are two deadlines to note. For the general issue, 15 April is the date to keep in mind. The deadline is 1 April for those submitting papers for Amanda Golden's topic of "Sylvia Plath and Material Culture." These papers should address materiality in any aspect of Sylvia Plath’s oeuvre. Of particular interest are historical approaches considering Plath’s poetry and prose. Topics may include, but are not limited to archives, things, commodities, texts, nature, the creative process, images, art, visual culture, and history. Any questions - just ask! And of course there is the forthcoming CD by the British Library. See the posts below from 17 March and 13 March to pre-order and receive a 10% discount. For those who want to purchase The Spoken Word: Sylvia Plath CD directly from the British Library online shop, the site is now open for pre-orders. Enter the code BLPLATHBLOG in the Voucher box and click 'Apply' to receive a 10% discount from your purchase. This is a special discount to readers of this blog and A celebration, this is. Please note: The CD will be on sale in the UK from 14 April 2010. The CD will be on sale in the US, distributed by University of Chicago Press, from 20 April 2010. The Barbizon is the focus of the article "Sorority on E. 63rd St." by Michael Callahan in the April 2010 Vanity Fair. During the "queer, sultry" month of June 1953, Sylvia Plath was a resident in room 1511. Pre-order The Spoken Word: Sylvia Plath, the forthcoming CD published by the British Library today! Sylvia Plath Info Blog and A celebration, this is are honored to be an accredited partner with the British Library for their forthcoming release. Clicking to order through this blog or my website for Sylvia Plath will save you 10% on your order. The British Library is offering this special bonus for readers and visitors of this blog and my website. Distribution in the US will be through the University of Chicago Press. Also, I've added a link US Orders link beneath the CD cover in the sidebar. Further information for ordering through the British Library Online Shop will be posted shortly. Within six weeks of Sylvia Plath's death, Ted Hughes gave Heinemann permission to disclose Plath's identity as the author of The Bell Jar. Naturally Plath's identity as the author wasn't completely anonymous: in certain circles, it was quite known that she was the author of the novel. When the Heinemann Contemporary Fiction edition was published in September 1964, the author, however, was still listed as Victoria Lucas. The back of the dustwrapper states that the author's name is a pseudonym and that they weren't at liberty to disclose the identity. 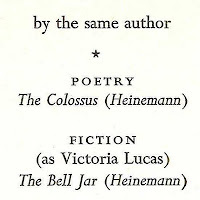 Plath's name was not on the title page of The Bell Jar for another two years, when Faber brought out their first edition of the novel on 1 September 1966. The Heinemann, Contemporary Fiction and Faber editions of The Bell Jar can be seen here; they are the first three in the first row. Did you know... On March 11, 1965, 45 years ago today, it was officially published that Plath was the author of The Bell Jar? It was on this day that Faber published Ariel. In the front matter, on verso of the half-title page where Plath's previous books are listed, two books are present (see image to the left). The first, a poetry collection, The Colossus. The title under the Fiction heading is The Bell Jar with the author given "(as Victoria Lucas)". This is the first time the novel appeared in print with the author's true identity stated and came a year and a half before Faber's publication of The Bell Jar. Plath's award of the Saxton Grant for a novel appeared in The New York Times on November 21, 1961. While the title and subject weren't mentioned, those interested in Plath might have made a mental note to keep on the lookout. Plath & Heinemann did actively market the novel to her American publisher Alfred Knopf. After a lot of discussion and consideration Knopf passed on it. These letters are held with the Knopf papers at the University of Texas at Austin. And, Plath's authoring the novel was discussed in "Poetry of Bay Stater Disturbs London Critics", an article about Ariel by Brenda Maddox which ran on June 5, 1965, in the Worcester Telegram. It is likely this article was syndicated in other newspapers around this time. Yet, it may just be the first to publicly tie the novel and the author together in her home state and country. Lucas Myers contributed an essay on pages 8-10 called "The Voices of Sylvia Plath and Ted Hughes." The essay has likely new pieces of information: conversations & memories remembered that may or may not have been in his 2001 memoir Crow Steered Bergs Appeared. But it's the end of the essay that I want to write about today. As most of you haven't read the essay I realize this puts you at a disadvantage, however I'll try to be fair and keep things in context. "As he told me at Court Green in 1963 or 1964 and wrote in Birthday Letters, he developed fibrillations of the heart and felt as though he were 'already posthumous'--soon after, at the beginning of his seventh year of marriage, he initiated an extramarital affair. His adultery enabled the full development of the 'Ariel voice' and freed Sylvia to enter upon her annus mirabilis and her death. Ted was blindsided by the surrogate of Ego. Subsequently, surrogates of her surrogate claiming to speak for her attacked him unremittingly until his death - and after it." This could be a matter of interpretation, but the way I read it Myers, crudely, seems to be creditng Hughes for his actions and their consequences. That by cheating on Plath, Hughes assisted ("enabled") Plath to break through to her "Ariel voice" which then led directly to her death. This seems quite callous and cold. The Ariel poems are all about a movement towards life, a new life. Not death. Perhaps in some ways 1962 was an annus mirabilis (and could be the subject of a full-length study, called Three Women, perhaps). But one must ask: at what it cost? Perhaps, if considering the idea of it, the annus mirabilis could be July 1961-June 1962? This period of time before the adultery had been a good year: increasing opportunities to work with the BBC, the move to Devon, birth of Nicholas, wonderful poems including "The Moon and the Yew Tree", "Three Women", "Elm", etc., work with New Statesman, the completion of The Bell Jar and the prospect of its publication, The Colossus was published in the US (albeit quietly), etc. Myers' displeasure at the surrogates of surrogates attempting to speak for Plath is hypocritical. Is he not doing to same thing through his possessive allegiance for Hughes by his flippancy towards Plath and denigration of her "surrogates"? Copies of the first Saint Botolph's Review are held at University of North Carolina at Chapel Hill, Emory University, Cambridge University, University College of London, University of Oxford, and undoubtedly in private hands. I'll have a little more on the first issue of the Saint Botolph's Reivew later this spring. "After meeting Susan Johns, with whom he was to have a son and a daughter, Rety opened a furniture shop in Camden High Street, where he sold an Edwardian writing desk to an American who asked him to re-cover it in blue leather. She kept asking when it would be ready, explaining that she was writing on her knees in the meantime. But when he took it to her house, a man told him to "f--- off" and that the woman was dead. On returning home, Susan told him that the lady was the poet Sylvia Plath, and he had just met her husband Ted Hughes." The whole "writing on her knees" bit sounds very much like Plath!